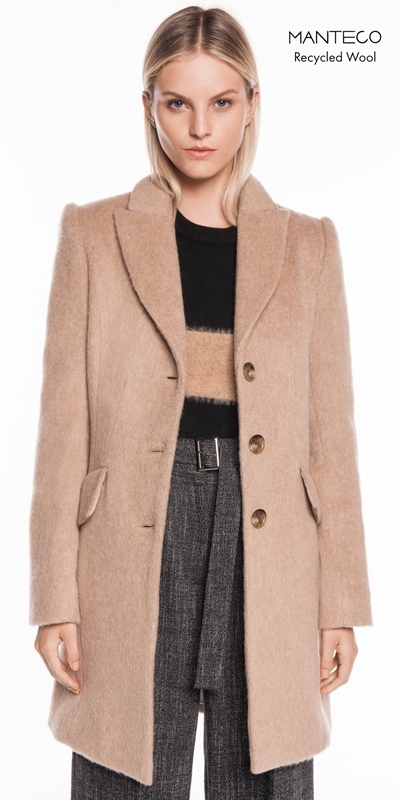 Made from a wool mohair blend from Italy, this relaxed coat features a wide peaked collar and lapel. Finished with front flap pockets. Fully lined. Fastened with a 3-button closure at the centre front. This coat is made using Manteco Global Recycle Standard (RGS) certified* recycled wool. Recycled wool is created from the reuse of old garments. Through mechanical processes and without the use of any chemicals, the fibre is extracted from the old garment and re-spun into new yarn. Recycled wool supports the circular economy through the reduction of water and energy usage and the reduction of CO2 emissions. Our partnership with Manteco allows us to bring you award-winning sustainable fabrics. In 2018, Manteco was awarded the "Radical Green Award" at Italy&apos;s Green Week - festival della green economy. Use soft brush to resore pile.